Exceptional location just steps to Cook Street Village, Beacon Hill Park, and downtown. Never a vacancy. Four self contained suites - 2 bedroom spacious main floor, 1527 sq ft, and 2 baths, 2 lower level suites, and an upper level bachelor. Total of 3,592 square feet of finished living space plus 200 square foot storage area. Lots of off-street parking and great access with back lane access. Property has been very well maintained and offers laundry units in main and upper floors and shared for lower suites. 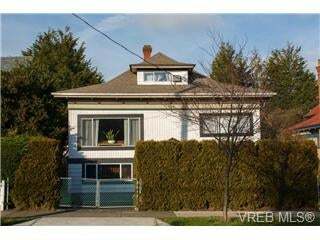 A wonderful investment opportunity or live in a portion of the house and live mortgage free. Total rents over $49,260. Great Cash Flow.